I love having afternoon tea at museums. There’s just something about having tea after browsing through galleries. The last time I was in the UK, in London, I made sure to have afternoon tea at The British Museum. 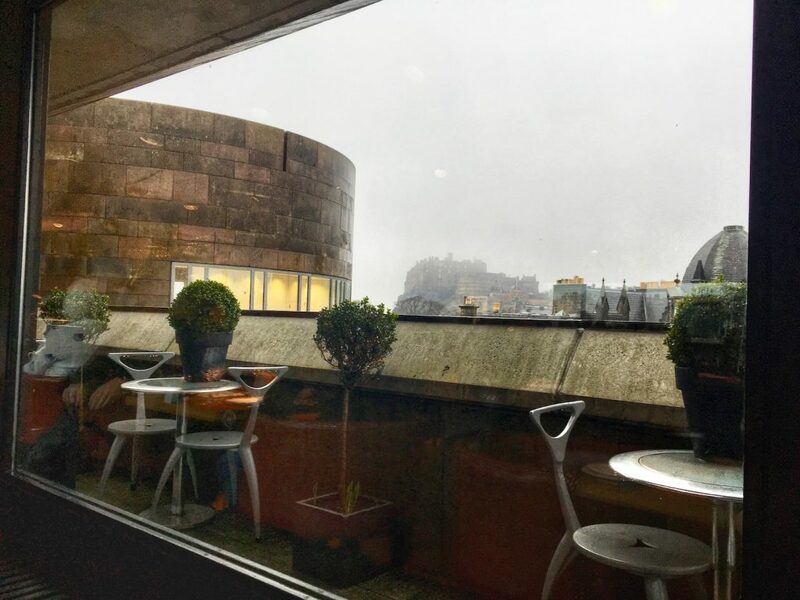 Now further north in the Scottish capital of Edinburgh, I also had tea in a major museum, The National Museum of Scotland. The location for tea isn’t exactly inside the museum. 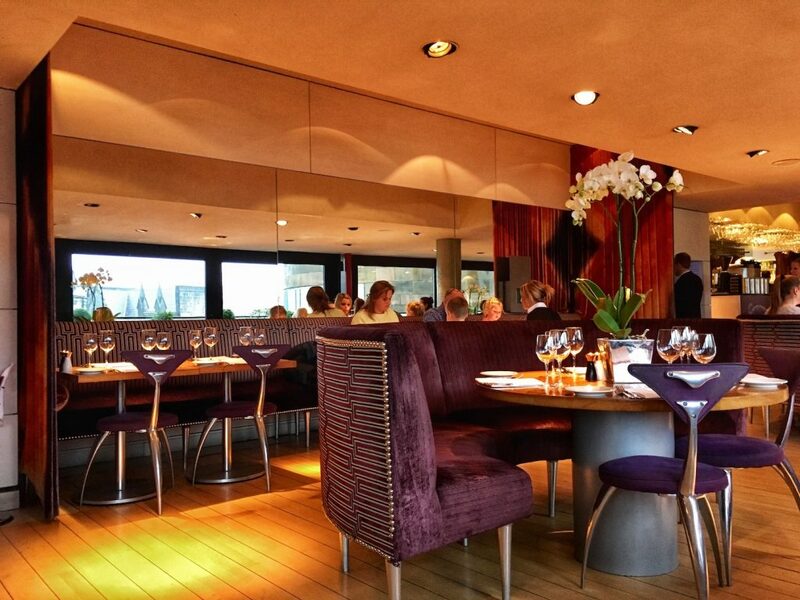 It’s in a special restaurant called The Tower for fine dining and views. 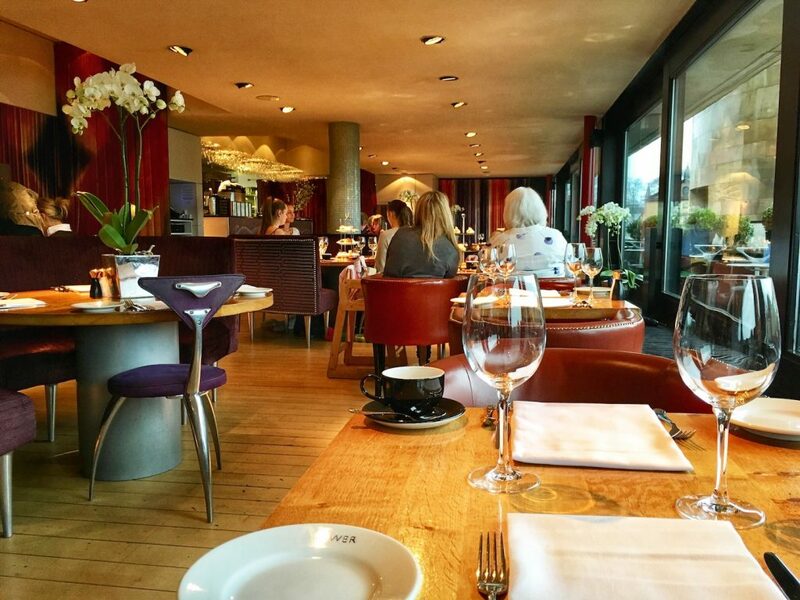 The Tower Restaurant is located inside the National Museum of Scotland. It’s located on the rooftop of the museum, allowing for spectacular views. 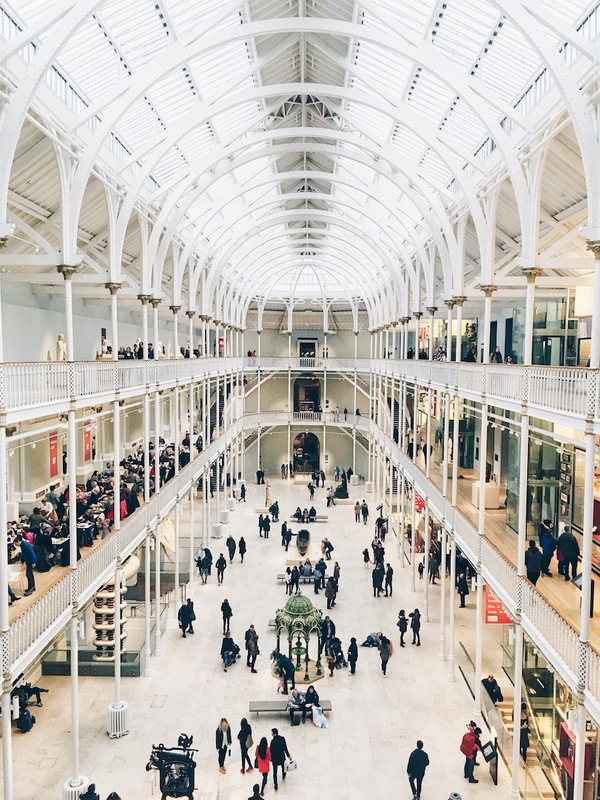 The museum is nearby many major attractions of Edinburgh like Edinburgh Castle and the Palace of Holyroodhouse. 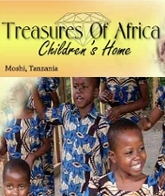 And the museum itself is also a main attraction! 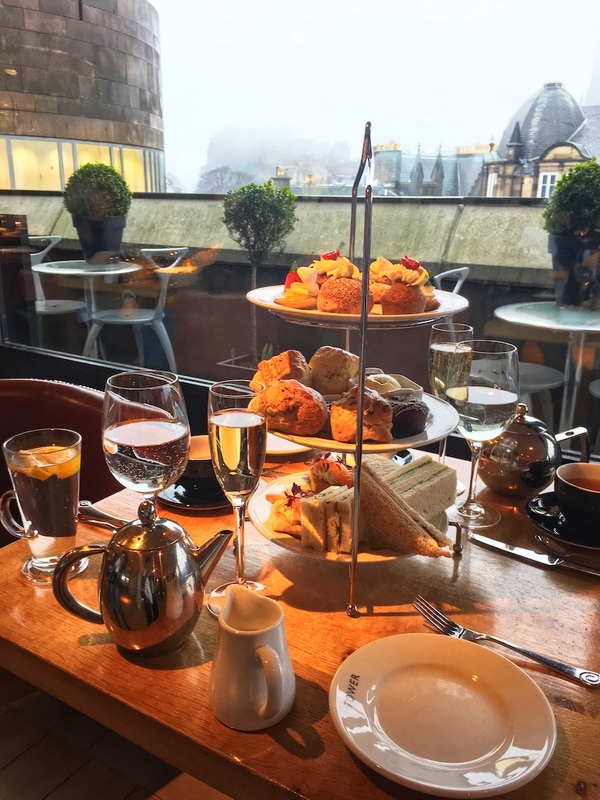 It rained all day on the day that I went for afternoon tea at The Tower Restaurant. 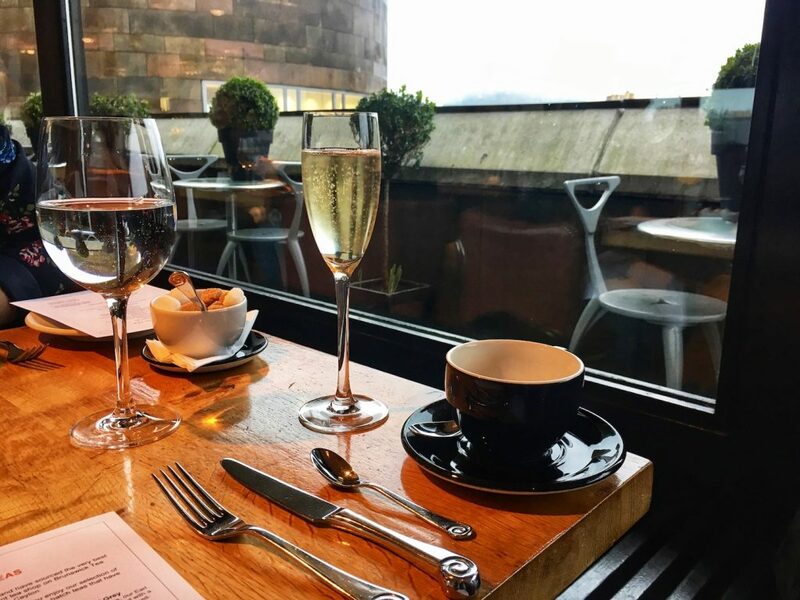 When I walked into the restaurant, I noticed the large windows that on a sunny day, I could imagine would have amazing views of Edinburgh Castle and beyond. Even though it was raining, I did get a glimpse of the castle, which even in the gloom and rain, is still pretty spectacular. It was a Saturday afternoon when I went for tea. At 4 pm, there were many other groups having a late lunch and afternoon tea. While looking over the tea menu, the server hinted that the Chai Cinnamon would be a good choice. I happened to feel like chai at that moment and was offered it with a choice of either hot or cold milk. Other options include the usual teas you’d find at an afternoon tea like earl grey, Darjeeling, oolong, peppermint, green. The difference here at The Tower is that they take their tea seriously (as stated on the menu!). They source their teas from a third generation independent tea shop from an estate in Ceylon. Apart from tea, there are also tea cocktails like G and Tea, Green Tea Mojito and Tower Whisky Iced Tea for £7 each. 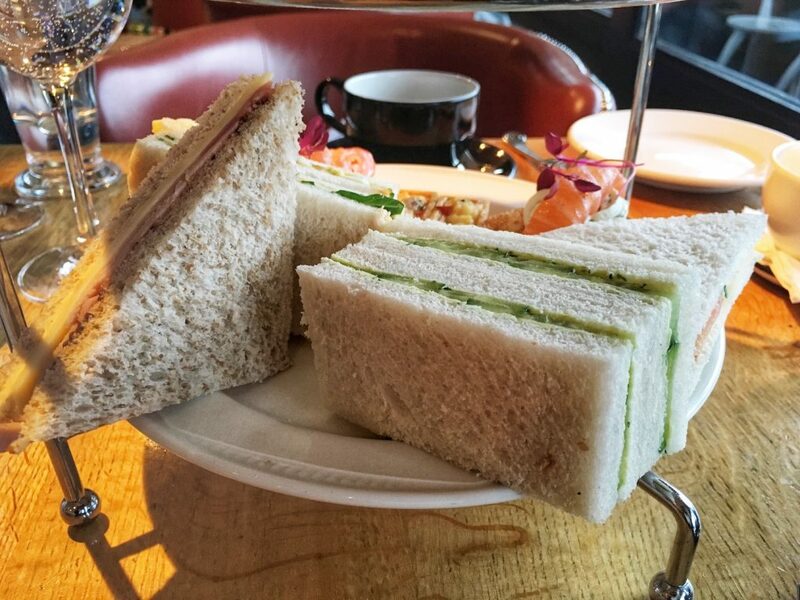 There are two options for afternoon tea at The Tower Restaurant. 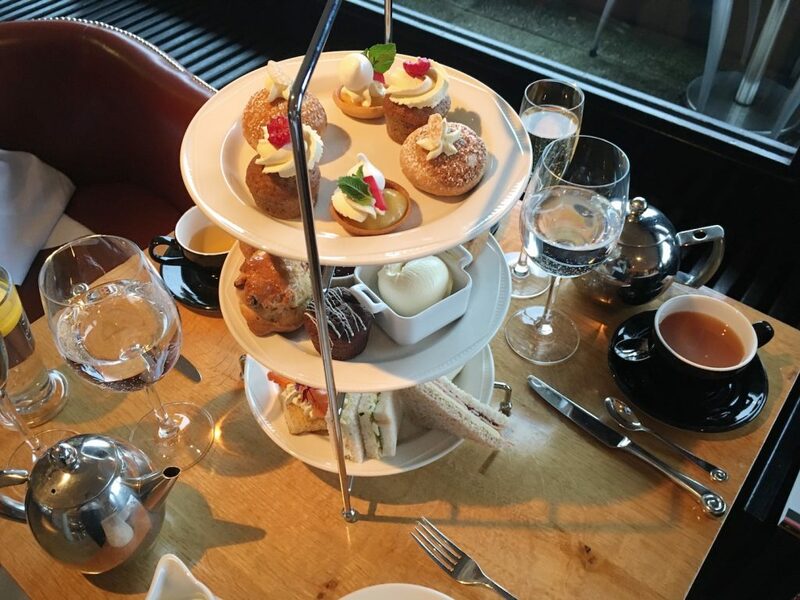 The Tower Afternoon Tea comes with a selection of savories, scones, sweets and a tea. 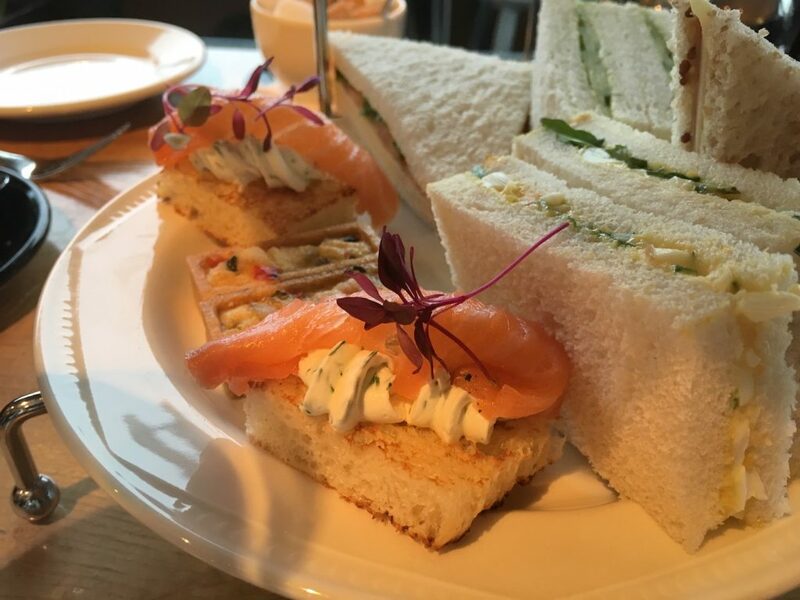 Meanwhile, in this review, I’m featuring The Tower Champagne Afternoon Tea, which includes everything in The Tower Afternoon Tea plus a glass of Billecart-Salmon champagne. Three sandwiches included ham and cheese, egg and a cucumber and dill sandwich. Two additional savories included a mixed vegetable quiche and smoked salmon and cream cheese on toasted brioche. All classic afternoon tea savories. One plain and one fruit scone per person arrived warm along with Cornish clotted cream and raspberry jam. I cannot stop talking about the scones. 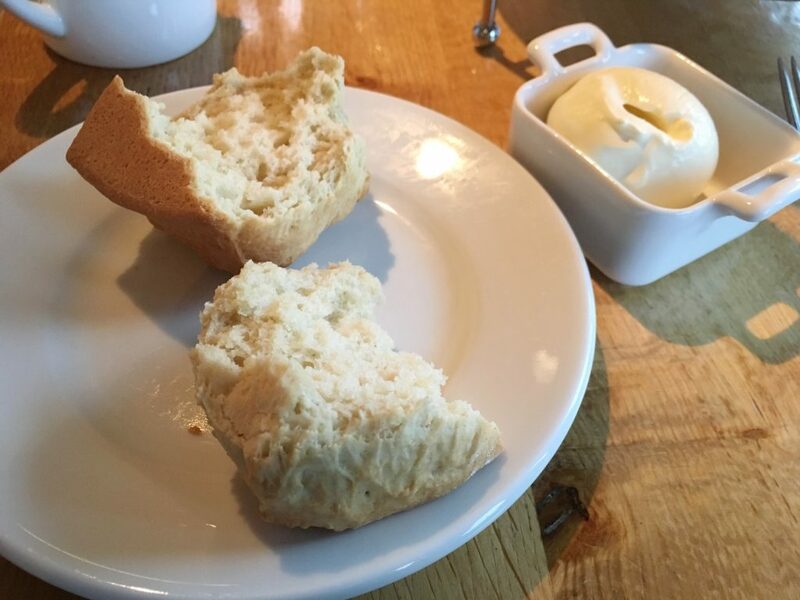 There’s just something about the scones and cream in the UK. I mean, they are the ones that afternoon tea originates from. So I can’t expect anything less! 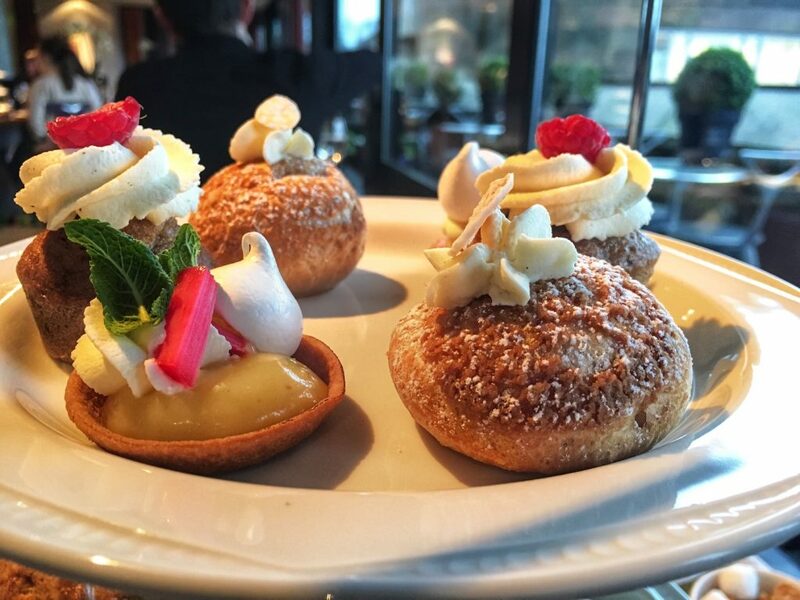 A selection of four cakes and desserts included a praline choux bun (hazelnut), banana and pecan cake and a lemon meringue. 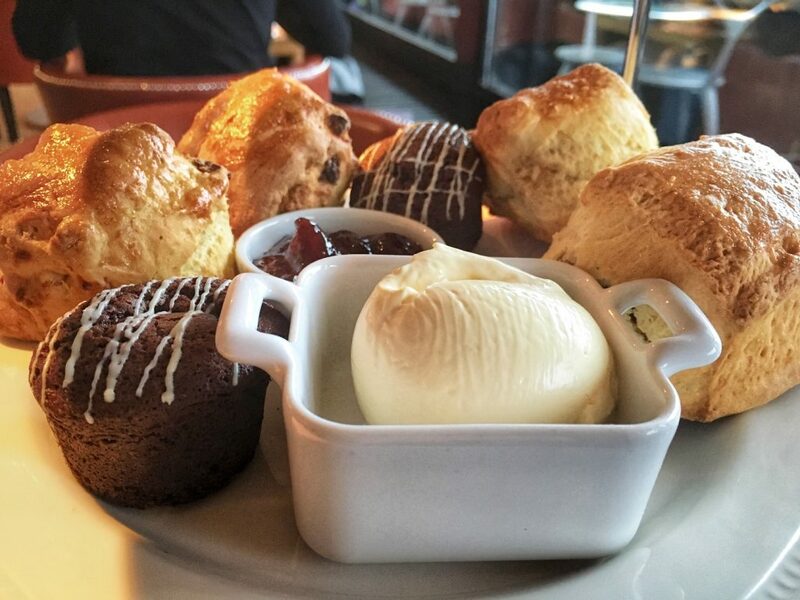 The chocolate terrine was on the same plate as the scones. Food arrived on a classic three tired afternoon tea stand. Individual plates had The Tower logo on them. Tea cups were standard in navy blue and tea pots were stainless steel. All seemed to match well with the wooden tabletops. No complaints. Everything arrived in good time. There is WiFi from the National Museum of Scotland. It is super fast and works in The Tower Restaurant too. The Tower is on Facebook and Twitter. They post occasionally on their Facebook page with upcoming specials. 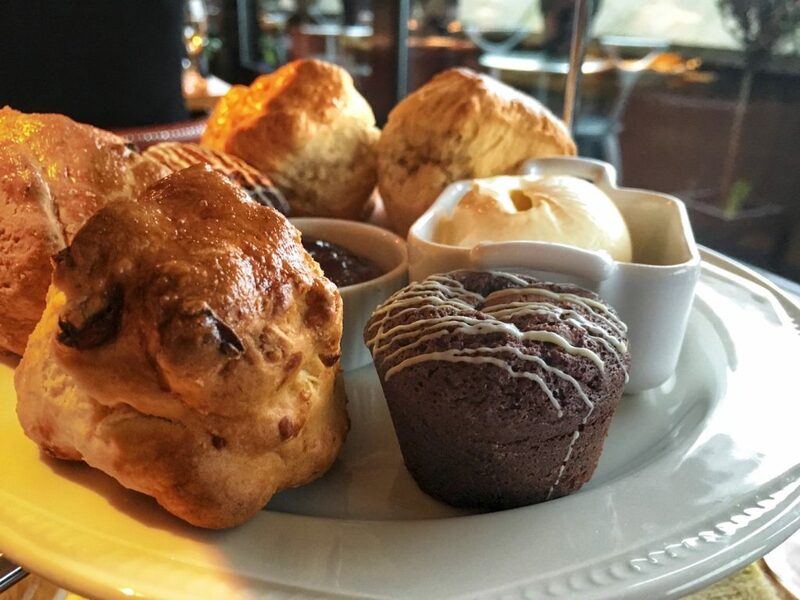 You can’t go wrong with an afternoon tea in the UK. 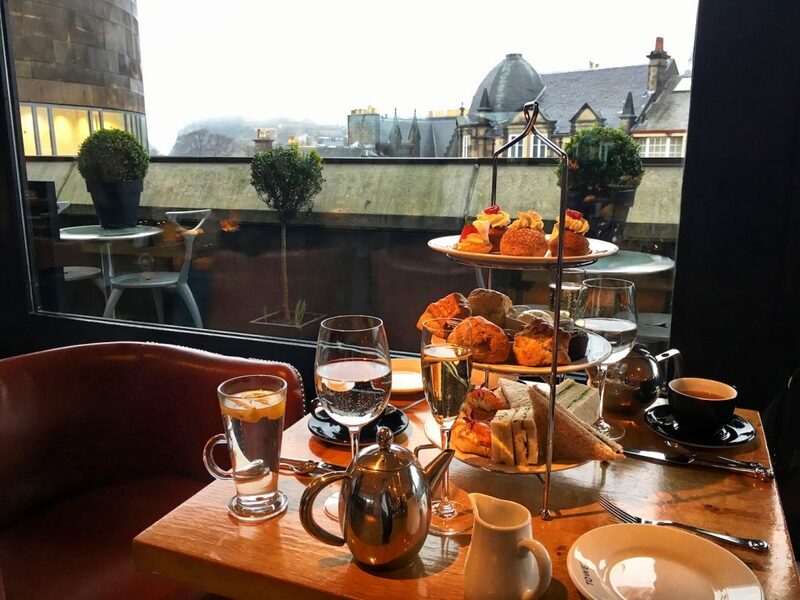 This was my first Scottish afternoon tea experience, and definitely not my last. I love afternoon teas at museums but they’re usually pretty mediocre. This one is different. You won’t be disappointed especially if you visit on a sunny day and get a view of the Edinburgh Castle. 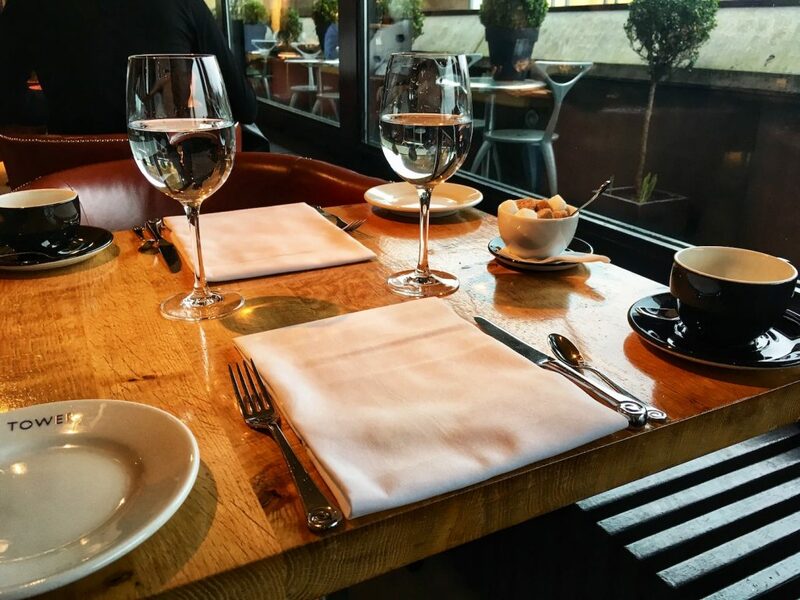 Note: A big thank you to the Tower for providing the afternoon tea for this review. As always, all views and opinions are my own.